PANGEA SPEED: Salt Flat Social!!!!! Here is the deal! 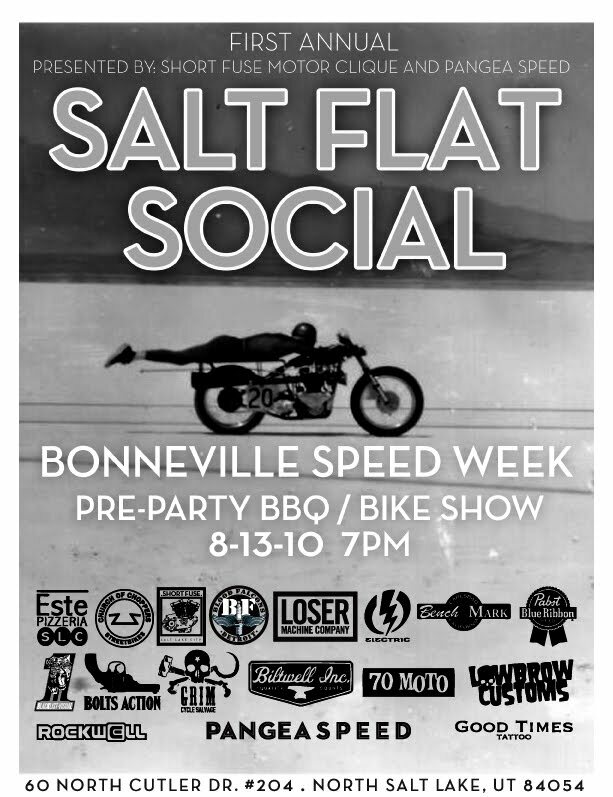 We all love going fast.... as fast as possible... well everyone who is anyone knows that the fastest place on earth is Bonneville (yeah like that motorcycle that everyone loves, it was named after this place) . Every year there is a week in august were people from all over the entire globe come to Bonneville to try to go faster than everyone else. Us Salt Lake Folk get pretty excited about everyone coming out so we decided to throw a little party. Here is the deal. Friday the 13Th of august, 7pm, 60N. Cutler DR. #204, North Salt Lake, UT 84054. 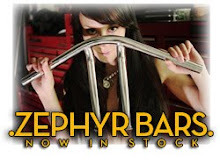 Everything is super layed back come hang out eat some food, hang out, talk, look at bikes. The event is free to get in but $20 gets you a rad shirt designed by Dan Christofferson and a raffle ticket for some jammin prizes from our sponsors. All proceeds go to keeping the event free. The next morning everyone is meeting up at Este Pizza Downtown(of moto monday fame). 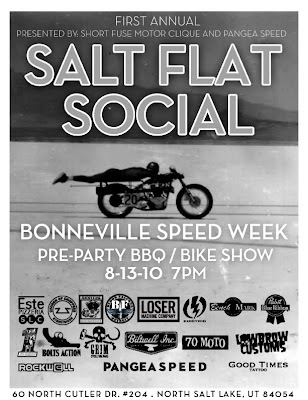 we will be meeting at 10 am so we can all ride our bikes to the Salt Flats for the kick off of Speed Week! Great event! This was my first ride with the Moto Monday crew. Some great people in this crew. Dug it. Nate, Hope you made it home alright. Not cool sitting alone on the highway for 3 hours huddled in the shade of your bike waiting for your wife to come pick you up. Hope you enjoyed the Gatorade. I'm in for the next Moto Monday.